STILL ENOUGH BY JOHN HOOPER. 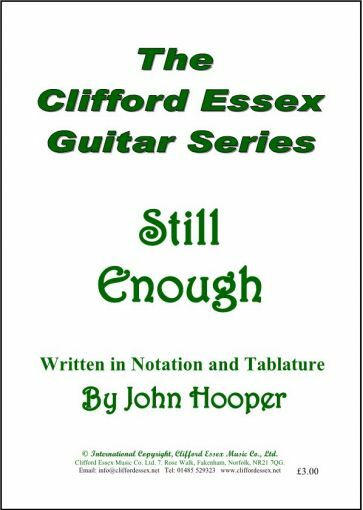 Location: /Sheet music/Guitar Series/STILL ENOUGH BY JOHN HOOPER. “I wandered long, up and down the silent space: no songs came. My soul was not still enough for songs”. From Phantastes by George MacDonald. Well, this piece tries to capture that stillness necessary for songs and music. It was written for a friend who was poorly, but has recovered. Although music undoubtedly has the power to help repair, this piece takes no such credit, - it is down to the good old NHS. The piece is suitable for those with small hands as it involves no long stretches, and no full barrés. The most stretchy bits are right at the end, bars 33 and 34. Both have half-barrés, and a bit of a stretch with the LH 3rd finger fretting F natural on the 6th string (bottom D). 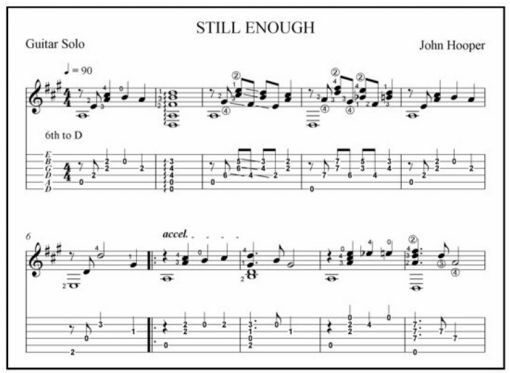 If this is too much, merely fret the 4th string (also D, of course) instead of the 6th and omit the 4th string’s two open D notes in both bars. Two things to note; first the bottom string is dropped to D; second, there is a key change at bar 25. (a). In bar 10, just before playing the D on the 3rd string, try removing all your fingers from the fretboard, - this acts to emphasize the notes which follow. (b). At the end of bar 10, damp the bottom D string, otherwise it will produce a slightly discordant/interfering tone with bar 11. Depending on your playing, you might need to damp that 6th string at the end of bars 18, 22, and 30. (c). There are a few legato slides (a slide in which the first note is plucked, but the second is not). These are shown as a straight line together with a slur. See bars 13, 18, 28 and 30. (e). I tend to slow down for the final few bars, but it’s a matter of taste. BMG Magazine - The musician's choice.